7435 Forsyth Blvd, Clayton, MO. 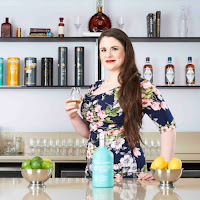 Cherish Varley is Remy-Cointreau’s newest brand ambassador, representing Westland and Bruichladdich. Cherish has been in love with these brands from when she first discovered them, having been the whiskey librarian at Untitled Supper club in downtown Chicago for two years. Most recently she is working with whiskey clubs as well as bartenders in helping their education of what single malt can be. She is proud to be presenting today in her home state of Missouri, even though she is a Chicago resident. Cherish firmly believes that the quality of sprits come from the people who make it, their passion for their product, and the quality of people who enjoy it (responsibly). This whisky is testament to our belief that raw ingredients matter. Trickle distilled from 100% scottish barley the spirit gently matures in the lochside village of port charlotte before being bottled here at the distillery using islay spring water. Opened in 2010, Westland Distillery evokes the traditions of Scottish whisky produced with ingredients exclusively from the Pacific Northwest. With a base of pale barley malt grown in Washington State, Westland American Single Malt Whiskey is produced from a grain bill comprised of five different roasted and kilned malts. Inspired by the craft-brewing culture of the region, specialty malts are then added to impart notes of chocolate, nuts, cookies, pastries, mocha, caramel and raisins. A Belgian brewerâ€™s yeast further enhances flavor development â€“ creating fruity esters during fermentation. Finally, the whiskey is matured in the finest new American oak casks to round out the flavor profile with hints of vanilla, caramel and coconut. â€œEvery whiskey at Westland Distillery is underscored by our house style â€“ a sweetness and ease on the palate accompanied by a fruity and complex but ultimately grain-focused finish worthy of its place in this new world,â€ says Matt Hoffman, master distiller at Westland, which produces 1,500 casks of the American Single Malt Whiskey annually. This peated whiskey is a bottling of two separate New Make spirits brought together after maturation. The first is made from a mash of peated malt, among the smokiest found in the new world. The second, from a mash of 100% Washington grown pale malt. When combined we create a single malt whiskey that encompasses a wide spectrum of peaty and smoky flavors without overwhelming the palate. 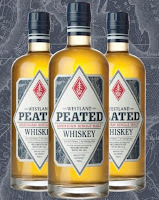 The peat character is sturdy enough to satisfy the cravings of those looking for a solid dose of smoke, while the pale malt contributes grainy and fruity notes that unify the whiskey. Westlandâ€™s Peated Malt is filled into a variety of oak, including 1st-fill ex-Bourbon and ex-Sherry casks, encouraging a controlled and even maturation. The result is a multi-dimensional yet balanced peated single malt whiskey. FLAVOR PROFILE NOTES The nose starts off with crunchy peanut butter, smoldering campfire and honey on a biscuit. The smoke from the campfire leaps out on the initial palate along with pistachio, almond and oloroso sherry. With time, the campfire transitions into smoldering earth and leather on the nose. Over the course of the tasting, the palate moves into dark, earthy herbs and spices. Peat iodine, anise, bing cherry and peanut butter remain on the finish.